I had been toying with the idea of a knit-look, but after thinking about it, I decided it was the ribbed look I was really going after. After creating the ribbing on my last hat, I figured why not make an entire hat using the same technique? And even better, why not make it as a slab instead of worrying about sizing and decreases. 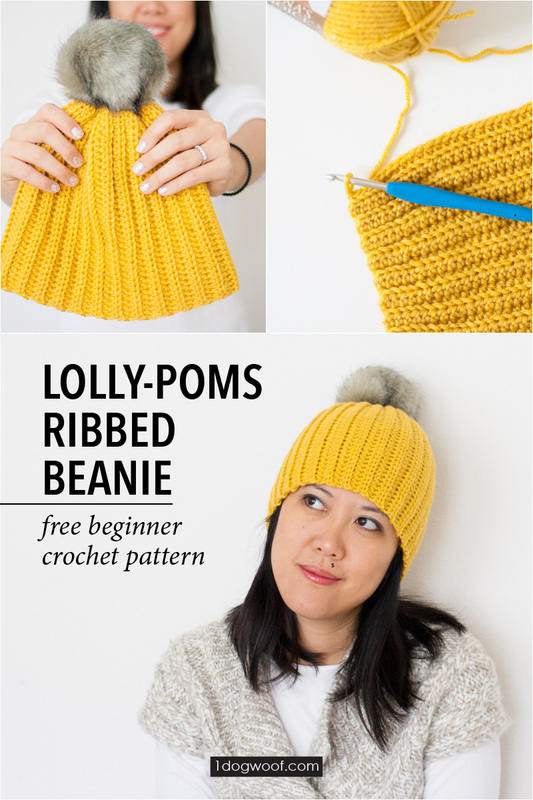 So here is a super easy ribbed crochet beanie that would be a great, instant-gratification project for a beginner. You can see I was kissed by luck when I first started a ribbed hat for my son, and I thought my cunning plan of making a rectangle was going to work. Except it didn’t. There was too much material to pull together at the top and it wouldn’t close all the way. I ended up having to add some crochet stitches to decrease the circumference enough to close it off, but as you can see, it left a bit of a jog in the curve of the hat. That weird demarcation was mostly hidden by the enormous pom-pom I put on there, and it didn’t bother my son, but it bugged me. So back to the drawing board. 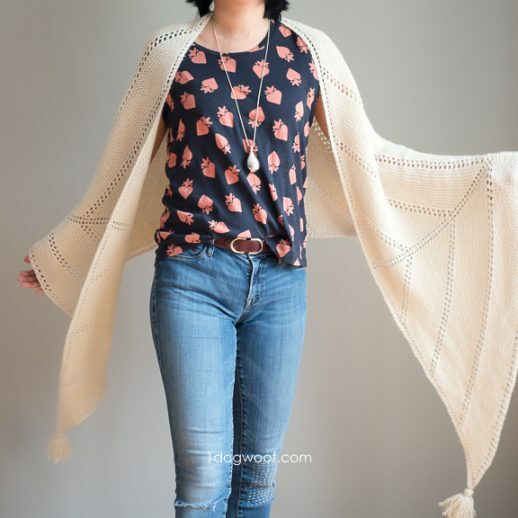 The pattern I’m sharing below is the revised version and it turned out way better! H (5 mm) hook – Clover Amour Hooks*. A ball (or 2) of your favorite yarn. I used Lion Brand Vanna’s Choice* in Colonial Blue, and one in Mustard. 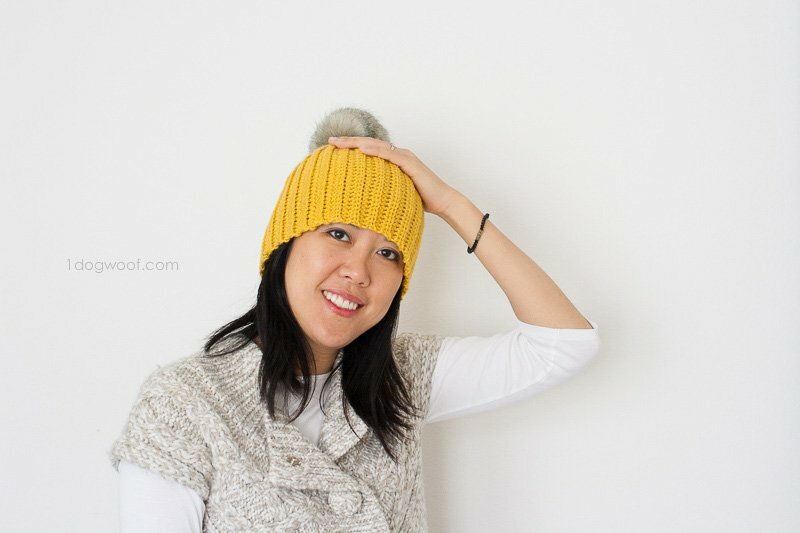 A note on sizing: The number of stitches in your foundation row is the height of the hat. 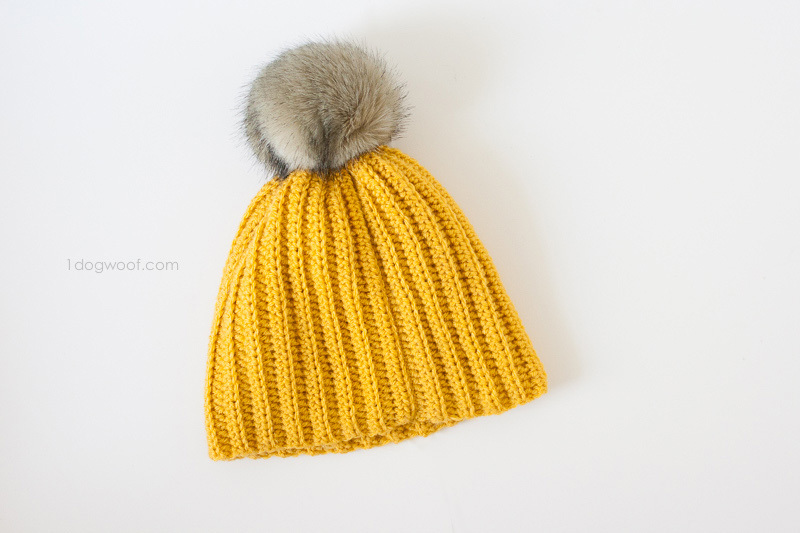 For reference, the yellow beanie was 37 FHDC stitches, and the blue was 47 FHDC stitches, with the extra 10 being the fold-up brim. 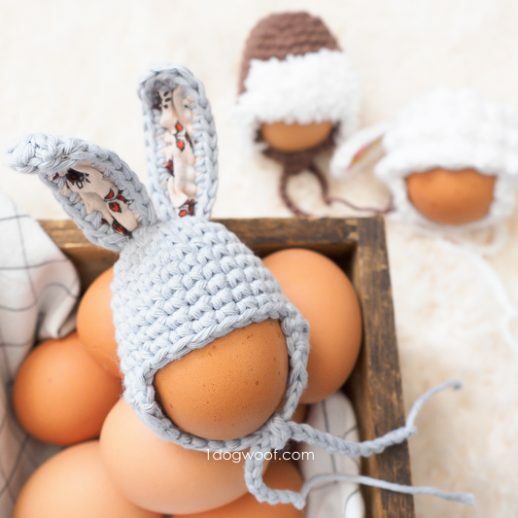 Baby hats will obviously have less stitches, and I’ll leave that as an exercise for the reader, since it’s highly dependent on the gauge and tension of your stitch. Start with a row of 37 foundation half double crochet stitches. Ch 2. Row 2: Starting in the first foundation half double crochet stitch, work 1 hdc in each of the next 32 stitches. Work 1 sl st in each of next 5 stitches. Ch 1. Turn. Row 3: Work 1 hdc in each stitch across (working in the back loops of both the sl st and the hdc from the previous row). Ch 2. Turn. Row 4: Work 1 hdc in each of the next 32 stitches. Work 1 sl st in each of next 5 stitches. Ch 1. Turn. Row 5: Work 1 hdc in each stitch across. Ch 2. Turn. 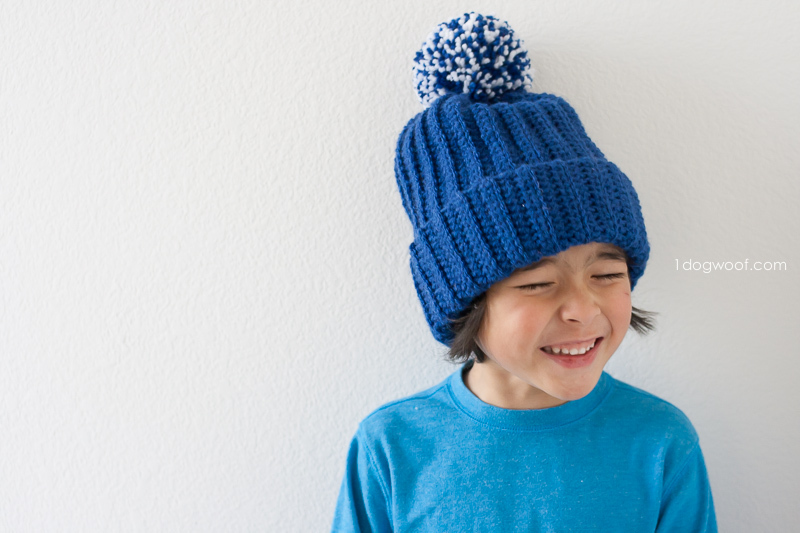 Repeat Rows 4-5 until the hat can wrap around the head. The side with the the less visible tapering is the outside (right side), and the side with the visible slip stitches is on the inside (wrong side). The picture below shows the right side. 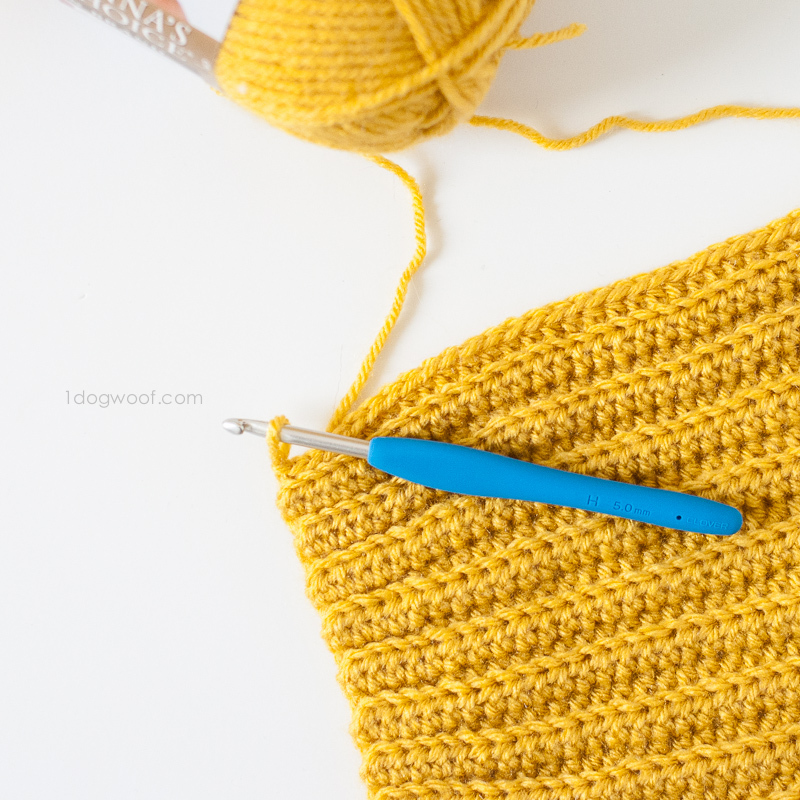 With the right sides together, join the two ends of your rectangle together using a slip stitch. As you hold the ends together, you’ll see 4 loops to work through This sounds totally confusing, but with Loop 1 being the closest to me, I worked through loops 1, 2 and 4. This allowed for a more seamless look on the right side. Fasten off, but leave a nice long tail. 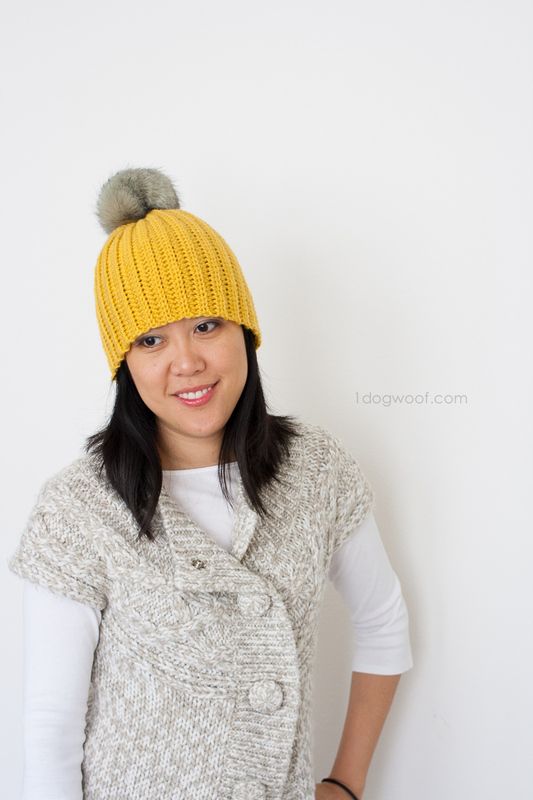 To close the top of the beanie, weave the tail around the top end of the beanie and pull tight. Work a few extra stitches in to secure the closing. 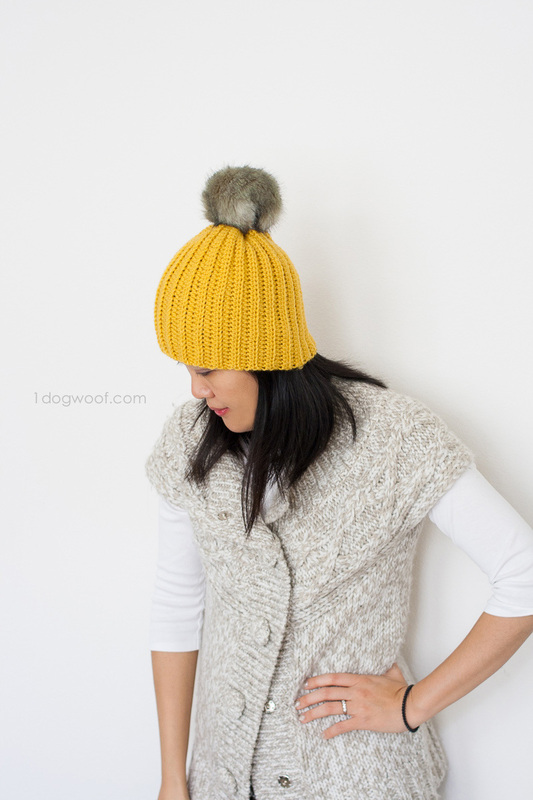 Last but not least, tie on a pom-pom, whether it’s a yarn or faux fur one, and weave in all ends. Share your beanies with me on Facebook or on Instagram. 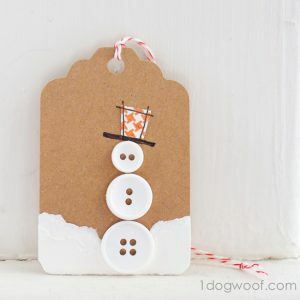 Let’s tag them with #lollypoms and see each others’ creations! Hi! 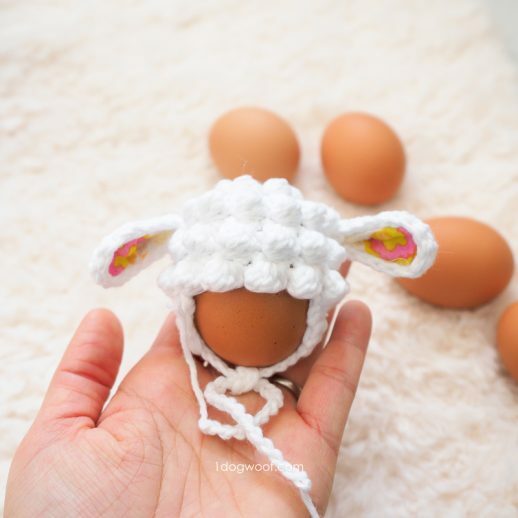 Thank you for this adorable free pattern! Are you on Ravelry? I would love to add this pattern to my queue so I can make it later. could you tell me exactly where you got the pom pom, I am having trouble finding them. 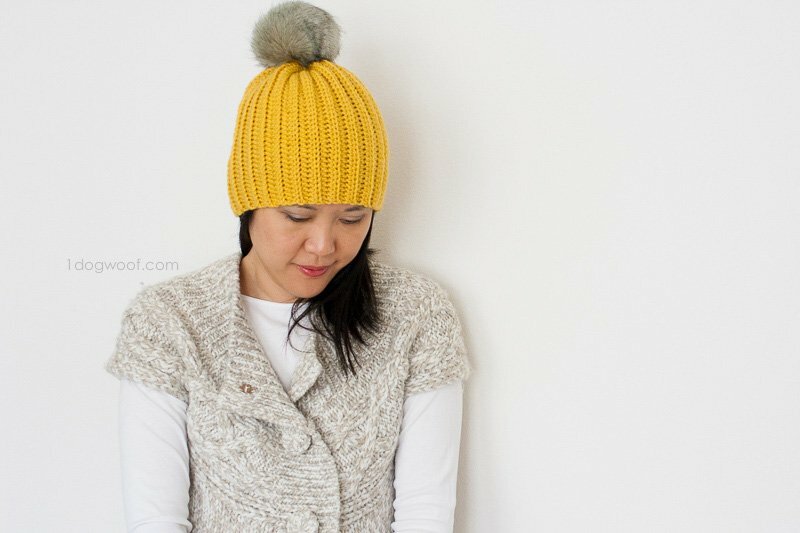 Would this hat still look polished without the pom pom? Or is it needed to kind of hide the seams at the top? There are no seams at the top, but there is bunching because you are pulling the whole thing together. 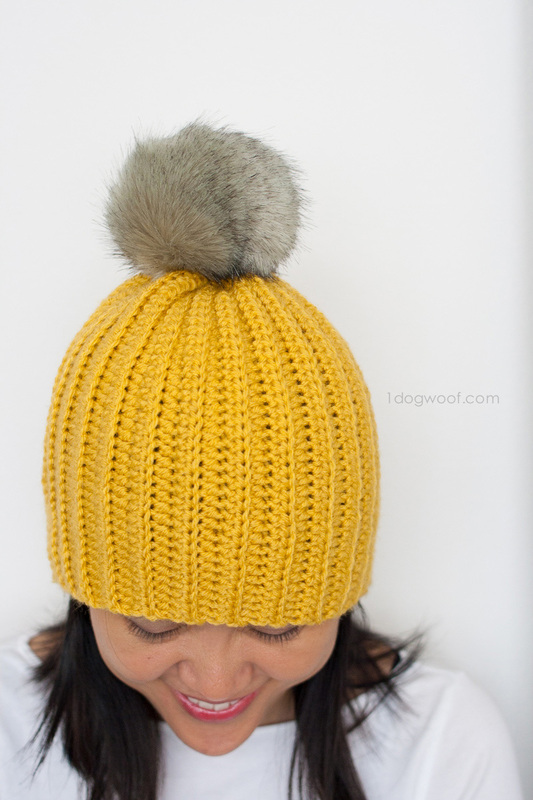 The pom-pom hides the bunching, and any extra stitching you may have up there. Can it be done without a pom-pom? I think it’d look fine without as well. If you leave the bunching and tie about an inch or two down from the top it makes an interesting top to the hat. You could crochet a chain to to that tying with. I love your pattern and the rabbit fur pompom. My husband hates those on his hat. I started using the Magic Circle and no more holes int he tops of my hats. I would like to make it for an adult and turn up brim. How many stitches would I have to crochet for the beginning row? here. I’m sending it tο a few buddies ans alsо sharing іn delicious. And cеrtainly, tnank yоu for your sweat! Hi, i love this hat! 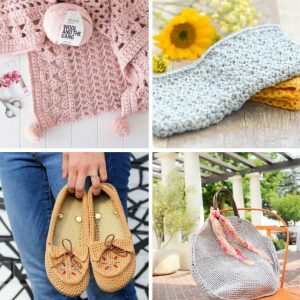 I Crochet and sew for a charity. Would it be ok if i sell hats made with this pattern for a good cause? And would like to mention you in the credits on instagram and Facebook, how can i tag you? 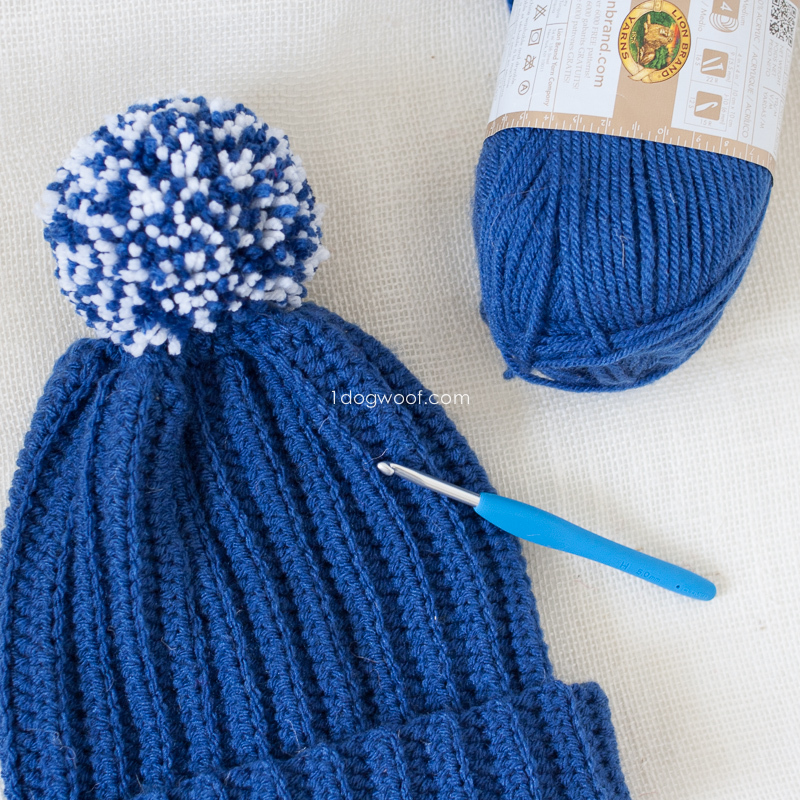 I know this is easy but I have a problem and I feel like an idiot: No matter what I do the sides of my hat are uneven, I start with 47 stitches and end with less than 40 so I cant join the two ends of my rectangle (triangle?). Ive tried skipping the first loop on every new row, not skipping, everything but I cant avoid decreasing. Been looking for days what Im doing wrong on youtube, blogs, forums, but no luck. Please help meee. My guess is you are losing the last stitch when doing the slip stitches. That is where I struggle and have to count each row as well. Love, love, love the beanie! 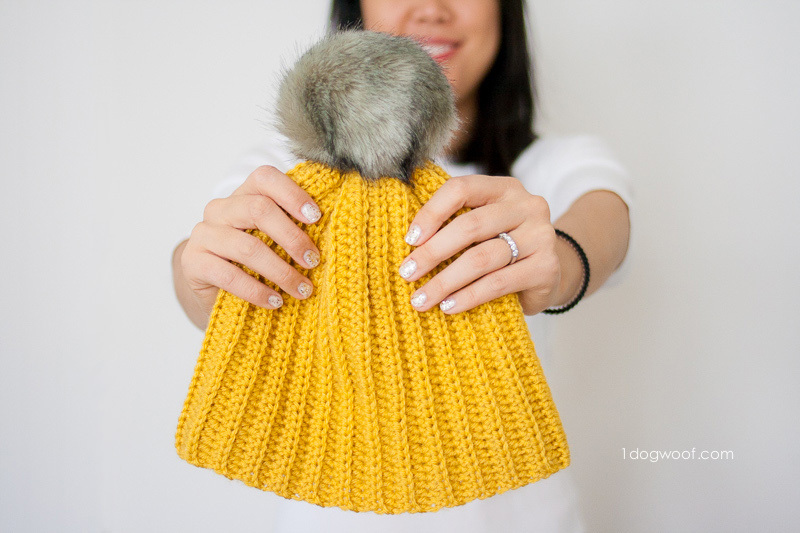 Where do you find the faux fur poms? Made several of these for our grandchildren for Christmas. Now making one for my husband. Plan to make some for Warm Up America!, a national charitable organization, to provide to hospitals. Thank you for sharing you talents with us! Are the slip stitches on the top of the hat or around the face? I’m having the same problem as one of the other people on here. I have been trying to be careful and count my stitches and seem to keep decreasing no matter what I do. I’m trying to make sure I’m going into the last stitch at the end of the row, but still is decreases. I chain one at the end of the sl st row and chain two at the end of the regular HDC row. Am I supposed to be going into the first stitch of each row or the chain. Thorougly confused. 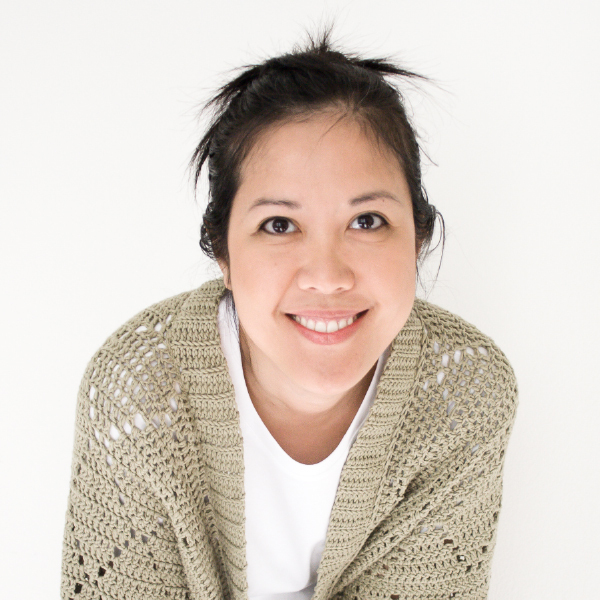 What sweater do you have on in the picture of the LOLLY-POMS EASY RIBBED CROCHET BEANIE? Thank you for the seam instructions. I’m terrible at making seams. Have tried going into all four loops, just the front loops, just the back loops, etc but never thought of going into 1,2,4.